Riverside tours are extremely popular - and a must for every Boro fan. 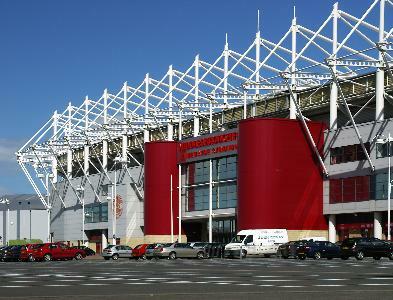 With its imposing position at the mouth of the Tees estuary, the Riverside is one of the most modern stadiums in Britain and has been used as a model by many other clubs. There are special deals for season ticket holders, and visitors for Sunday lunch at the stadium receive a free tour as part of the package. MFC also arrange special VIP tours several times a year. These give supporters the chance to meet star players in the dressing room and obtain their autographs. Summer tours are also arranged at Boro's Rockliffe Park training ground, which is widely acknowledged as one of the best in Europe. The complex includes a state-of-the-art sports science department and gym, rehabilitation areas and massage rooms, spacious changing rooms, saunas, steam rooms and Jacuzzis - plus a restaurant geared to the specific dietary needs of footballers. There is also an impressive indoor sports hall offering a massive indoor playing area made from a revolutionary artificial surface that minimises the risk of injury. Home of the team talks and hairdryers. See everything the players have to get them ready for the big game - from music to treatment to food. The referee and assistants have their own dressing room. Use the buzzer to let the teams know you are ready and want them in the tunnel, now! Line up in the players' tunnel before running out to pitch side. Imagine the adrenaline building as you look over to the opposition. Imagine running out in front of thousands of screaming fans with the Pigbag blasting out of the loud speakers as you come out of the tunnel. Steve Gibson would be looking down from the director's box behind you. See where the post match press interviews take place and sit in the manager's interview chair. Take some questions from the press but watch out for a real grilling if you are doing badly! Every player that has represented their country whilst playing for the Boro gets a place on the board - from George Hardwick to Gareth Southgate How many have you seen play. All the big decisions are taken here! Look out of the big windows - can you picture the scene on a matchday when 35,000 people arrive at the stadium? Sit in Steve Gibson's seat and get the view he does. You can see what it's like to own a Premiership football club. All tours must be booked in advance. Please have your phone number and party size ready.